Blow for developer, as Glen Abbey golf course granted heritage status. Canada’s Glen Abbey golf course appears to have been saved from redevelopment, with its local council recently deciding to impose heritage status on the Jack Nicklaus-design. 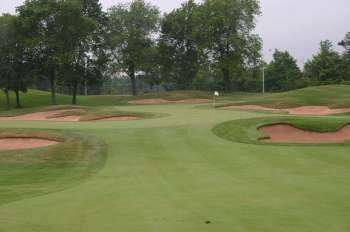 Current owner, ClubLinks, had sought approval to convert the 1976 golf course into a 3,200 dwelling residential precinct but was thwarted by a Save Glen Abbey Coalition group that campaigned on grounds that the course was important to both Canadian golf as well as the local Oakville area. Victoria’s Moonah Links development was, in many ways, modelled on Glen Abbey and similarly has an owner looking to make radical change. Though unlikely to be considered worthy of heritage status, the odds of the Mornington Peninsula Council approving the redevelopment plans of the Chinese consortium who owns the Moonah Links facility seems equally remote. Glen Abbey golf course has unanimously been voted as a heritage site after a council meeting was held Monday in Oakville, Ont. Glen Abbey owner ClubLink had proposed a development that would see the course become a mix of some 3,200 residential units as well as office and retail space. Fraser Damoff, a spokesman for the Save Glen Abbey Coalition, a group fighting to stop the development, described the golf course as a “gem” for Canadian golf and part of the town’s identity. “Oakville as a whole has built around Glen Abbey over the years. It’s been central to the design of the town. Certainly when a lot of people think Oakville, they think of Glen Abbey,” he said.